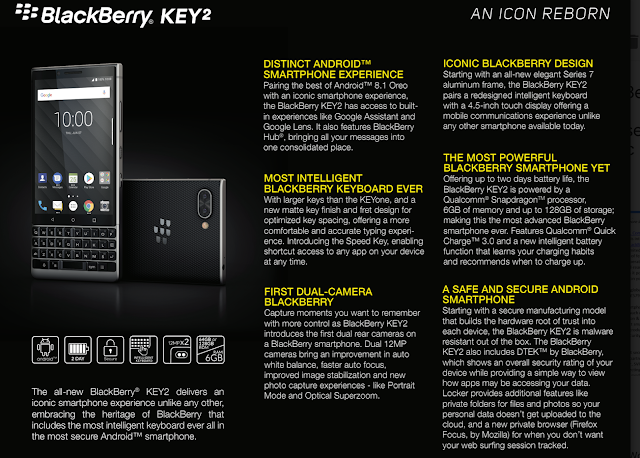 Ladies and gentlemen, I introduce you to the recently launched BlackBerry Key 2. For years I had heard people miss their keyboard based phones, and even the Priv wasn't cutting it. So ... they launched the KEYone. And it was met with some mixed reviews. Some loved it, some didn't get it. Well, must have found the right niche as they have brought its successor to market now, and it's positioning itself very modestly. Going for just $829 outright, it will position itself nicely under the price heavy flagship, and seeing that typically their main clients are corporate the savings on price will be favoured to sacrificing top end specs (which most would not notice anyways). Well played. The 3:2 screen ratio is ... different, and I sort of get it because of the keyboard, but I don't get why they haven't switched to the software navigation buttons versus the soft buttons. Guess that's just me. What really has me stoked is that 6GB of RAM. That's a beast. When I reviewed the KEYone, I found it slow. After testing I weiped it and tried again to see if there was something, and even with minimal installs I still found it to be a little sluggish. With twice the RAM from last year it shouldn't have the same issue. Oh... and a HUGE battery too. The suits will definitely enjoy not having to worry about battery life. Smallelessereen, leser powered processor and a huge battery should give you days. 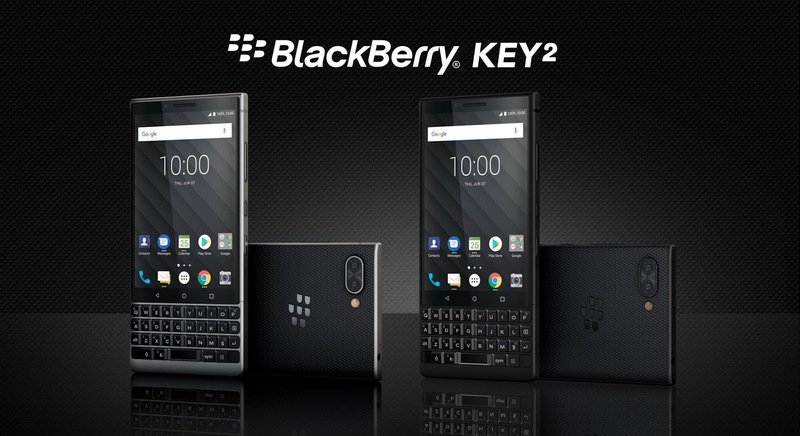 NEW YORK – JUNE 7, 2018 – Today, TCL Communication, a leading global smartphone manufacturer and BlackBerry-brand licensing partner, is introducing the world to the most advanced BlackBerry® smartphone yet with the debut of the BlackBerry® KEY2. Featuring an iconic BlackBerry physical keyboard and loaded with BlackBerry Limited’s best security and privacy enhancements, this all-new BlackBerry smartphone packs a number of features that are firsts for any BlackBerry smartphone. Running the latest Android™ 8.1 Oreo operating system, the BlackBerry KEY2 is the first ever BlackBerry smartphone to feature a dual-rear camera. It also includes the introduction of Speed Key, a universal shortcut key that now makes it possible to instantly access the apps, contacts and functions you use most from anywhere on your device at any time. The BlackBerry KEY2 will begin shipping globally1 beginning this month with the suggested retail price starting at $649 USD / €649 EUR / £579 GBP / $829 CAD. Beautifully crafted and deliberately designed for today’s modern smartphone user, the BlackBerry KEY2 represents a clear step forward in the KEY product series, bringing together premium materials and refined details in this all-new BlackBerry smartphone. Starting with an elegant Series 7 aluminum frame for added durability, this continuous frame design offers a cleaner look and feel while increasing strength. The soft touch back has been updated as well with a new diamond pattern that adds to the premium design while also adding more grip and comfort. BlackBerry KEY2 has a redesigned intelligent keyboard as well as a 4.5-inch touch display that includes 2.5D Corning® Gorilla® Glass which offers increased scratch resistance and creates a more seamless design and edge to edge look. The BlackBerry KEY2 also features a more impressive BlackBerry camera experience with the introduction of the first dual-rear camera on a BlackBerry smartphone. These dual 12MP cameras bring an improvement in auto white balance, faster auto focus, improved image stabilization and new photo capture experiences never before available on a BlackBerry smartphone. The BlackBerry KEY2 also introduces new capture modes, like Portrait Mode and Optical Superzoom. With Portrait Mode, users can now capture beautiful portrait photos creating more dramatic and professional looking images. In addition, Optical Superzoom makes it possible to capture better photos with greater details; even from further away. And Superzoom uses multi-frame capture to reduce noise on zoomed photos with a seamless user experience that only presents the very best image. BlackBerry KEY2 also integrates Google Lens, so now you can more quickly and easily search and get more information on things like book reviews simply by capturing a picture of the book’s cover, get landmark details and much more. Like all BlackBerry smartphones, the BlackBerry KEY2 includes enhanced security and privacy features right from the start. From a hardened operating system to BlackBerry’s proprietary technique for establishing a hardware root of trust adding security keys to the processor, the BlackBerry KEY2 is the most secure Android smartphone. It comes preloaded with DTEK™ by BlackBerry application that removes the complexity of security by providing an ‘at a glance’ security meter. This shows the overall security rating of your device, and provides a simple way to view how apps may be accessing your data and manage app permissions. So now you can easily see and manage how your downloaded apps access your personal mobile data such as your location, access to your camera, microphone and more, with active controls over your mobile privacy and safety. The DTEK™ by BlackBerry app now includes the new Proactive Health check feature, which enables you to scan your device and receive instant feedback on potential vulnerabilities and security optimizations. Locker has also been improved to offer even greater personal privacy and control over your content. With features like private folders for documents and photos so they don’t get uploaded to the cloud and Firefox Focus, the privacy browser by Mozilla, for when you don’t want your web browsing session tracked, Locker is all about personal privacy control. This pre-loaded privacy application can only be accessed with your fingerprint or password, helping store and protect sensitive user data, apps and content such as photos and downloaded files. The BlackBerry KEY2 is also part of the Google-led Android Enterprise Recommended program aimed at helping businesses select the best Android smartphone for their organization. With the Android Enterprise Recommended BlackBerry KEY2, business users can buy with confidence knowing they’re getting the most secure Android smartphone experience possible. This means meeting elevated requirements established and validated by Google, including timely security updates (which BlackBerry Mobile provides monthly), business-ready hardware features and at least one major OS update. BlackBerry KEY2 also supports Android zero-touch enrollment, making it seamless for large organizations to deploy and manage their corporate-owned mobile devices. The BlackBerry KEY2 pairs the best of Android™ 8.1 Oreo with an iconic smartphone experience youncan find only in a BlackBerry smartphone. With access to millions of apps in the Google Play™ store and built-in experiences like Google Assistant and Google Lens, the BlackBerry KEY2 is the modern BlackBerry smartphone you’ve been waiting for. It also has the enhanced Convenience Key, making it easier to access your most-used apps with custom profiles for at home, in the car, in a meeting or on the go.